Being the good Italian girl that I am, I love gnocchi. I love the way it’s spelled, and the way it sounds – I even love the way they look like stumpy little catepillars. Whoever created them had a good sense of humor. Plus, what carb addict wouldn’t like the fact that they’re a combination of noodle and potato? I thought I’d send you a no-fail potato gnocchi recipe that’s shockingly easy. Generally I’m not a “short-cut cook” but I think you’ll agree that this is the way to go. The recipe was passed on to me from my sister-in-law, who is married to a Sicilian, and it was given to him by his Italian restaurant-owner friends. Add this mixture to processor and mix at low speed until dough forms. Flour hands and table and knead dough then roll out flat, cut into strips and roll the strips into ropes. 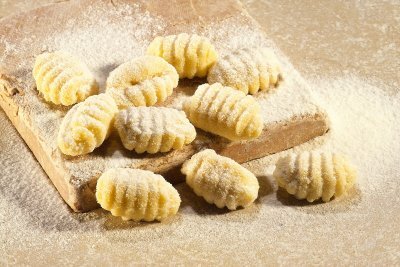 Cut the ropes into bite-sized pieces and roll each piece with the tines of the fork (for that “gnocchi look”). Boil in salted water for about 3-5 minutes. Drain with slotted spoon rather than a colander because they are a bit delicate. Add sauce of your choice. You can play around with the dough by adding parmesan, minced sun-dried tomatoes, spinach, whatever takes your fancy. My impression: Made with good quality dried potatoes this will be quite good; about the only change I’d make is to use fresh rather than dried herbs. Sounds easy enough! And I have some fresh basil in my fridge that’s desperate to be turned into pesto sauce. Perfetto!!! PS- I have a potato ricer…Just saying. Your Mommy also has a potatoe ricer!!!! It’s yours now !!!! !